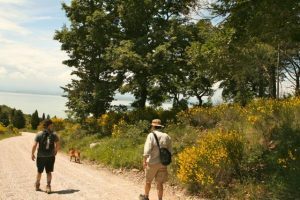 In early June 2016 I took a couple of friends on the Pian di Marte Walk, a route from my book, Circular Walks On The Tuscany Umbria Border, available as a Kindle download from Amazon. 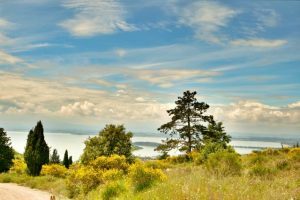 It’s a fairly long walk and took us over 4 hours, so it’s not a route if you are planning a quick stroll. 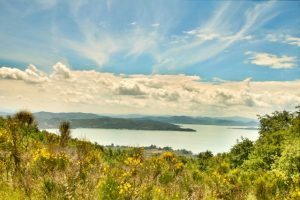 It starts with a tough climb from the valley floor up to ridges with views of Lake Trasimeno followed by a descent through thickly wooded hillsides. 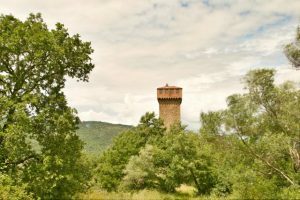 If you ever bought the original hard copy of the book you may recognise the Torre di Fiume which featured on the cover photo. A decade later, the tower is almost fully restored and makes for a very fancy residence. We finished just in time, no sooner had we arrived back home than we heard the ominous rumble of thunder.